​Edinson Cavani is a fitness doubt for PSG’s upcoming Champions League round of 16 clash with Manchester United, after picking up an injury against Bordeaux on Saturday. 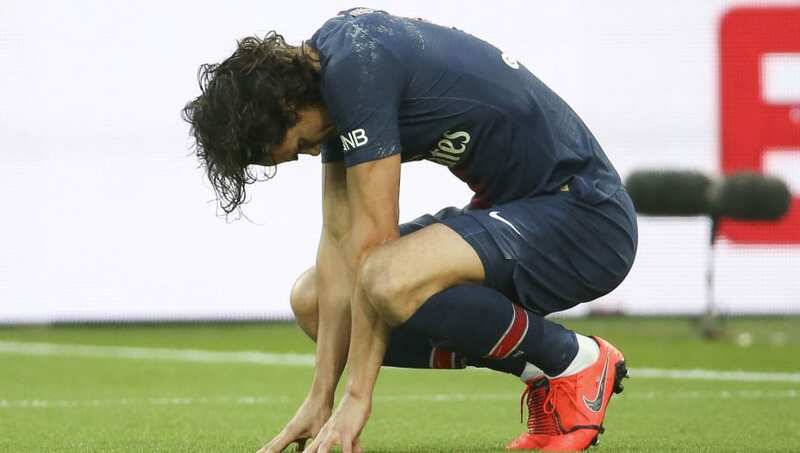 The Parisiens won the Ligue 1 encounter 1-0 courtesy of Cavani’s 42nd-minute penalty, though the Uruguayan was later withdrawn at half-time after appearing to suffer a thigh problem. The striker could miss Tuesday’s visit to ​United, alongside fellow attacker ​Neymar who has already been ruled out of the tie with a broken metatarsal. Speaking after Saturday’s game, as quoted by ​BBC Sport, manager Thomas Tuchel said of ​Cavani: “We have to wait. Saturday’s win lifted PSG 13 points clear at the top of Ligue 1 and well on course to retaining their domestic crown, despite their previous 2-1 defeat to Lyon. The likely absence of Cavani, alongside Neymar, would be a serious blow to the Parisiens as they prepare to face United at Old Trafford in the first leg of their huge Champions League encounter in midweek, with only ​Kylian Mbappe remaining fit out of their usual front three. The Frenchman replaced Cavani after he was withdrawn on Saturday, with the World Cup winner now set to shoulder a heavier goalscoring burden in the absence of his fellow attacking stars. Cavani has been a key figure in PSG’s frontline this season, scoring 16 goals in 15 Ligue 1 appearances, with two strikes to his name from six Champions League games this term. Neymar’s absence is also likely to be felt at Old Trafford, with the Brazilian having scored 13 goals in as many league games for the French champions this season. However, PSG will maintain a strong attacking threat through Mbappe on Tuesday. The French sensation has recorded 18 goals in 16 Ligue 1 outings during the current campaign, with three strikes to his name from six Champions League games.